Taylor-Made Deep Creek Vacations is excited to announce the beginning of their Deep Creek Kids Adventure Program! This year long and ongoing program is offered to both local and visiting kids in our area. For a mere $5, parents can purchase an Adventure Pack where everything comes in a cute little lunch bag. Inside the bag, the kids will find a bevy of cool items. Included in the package is a small sand bucket and shovel along with a variety of coupons and free giveaway to some of our area vendors. (Free ice cream, free arcade games, reduced special for laser tag; basically all things fun for kids!) The fun continues with a passport book they get that comes with a list of local vendors in the area. Once they visit the establishment, they ask for their passport to be stamped. 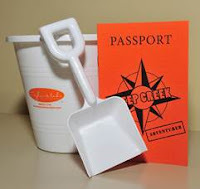 Once they receive 5 stamps, they can come in to Taylor-Made Deep Creek Vacations and get a free Frisbee. After 10 stamps, they come in and enter their names in a drawing for a chance to win a free 8GB iPod Touch! (I was bummed when I was told that I was not eligible for this prize). It’s a great way for the kids and parents to check out some of our “Local Flair”, have fun, and get a chance to win prizes. Come in and get yours today! Fun activities at the Monday Welcome Party! We are also pleased to say that we are once again attending the Welcome Party Mondays held each Monday on the lawn at Uno Chicago Grill. This is an awesome chance to come out and learn about activities, happenings and events in the Deep Creek Lake and surrounding area. Area vendors show up and woo you with their goods and are also there to help you plan some activities for your time spent at Deep Creek Lake. The admission is free and there are also complimentary finger foods & refreshments available. Live band entertainment will also begin at the Honi Honi from 5-8 pm. If you are out and about on Mondays, stop by and see us. We can’t wait to see you at the lake!